We regret to inform you of the death of PJ COSS ,Moorefield Park Newbridge Co.Kildare. Reposing at Anderson and Leahy’s Funeral home Newbridge on Wednesday from 3pm with prayers at 8pm. Removal on Thursday morning at 10.30am to arrive at St.Conleth’s Parish Church Newbridge, for 11am Mass with burial afterwards to St.Conleth’s Cemetery Newbridge..
Reposing at Anderson & Leahy’s Funeral Home, Newbridge on Wednesday from 3pm with prayers at 8pm. Removal on Thursday morning at 10.30am to arrive at St. Conleth’s Parish Church, Newbridge for 11am Mass with burial afterwards in St. Conleth’s Cemetery, Newbridge. We regret to inform you of the death of Philomena Clarke mother of John (Innovation/SIRO- formally CSS Longford). Reposing at her residence this Tuesday evening with removal to arrive at St. Anne’s Church, Killane at 7pm. Funeral Mass tomorrow, Wednesday, morning at 11am with burial afterwards in St. Patrick’s Cemetery, Shercock. Our thoughts and prayers are with John and his family at this sad time. After over 36 years service, Sean Murphy HV Stations Cork has retired. Over the years Sean has worked in the Pole Field Blackpool, Wilton Stores and HV Stations Cork. Sean’s skills are legendary ..and has gotten many a colleague out of a tight corner over the years. All of us who have had the pleasure of working with Sean will greatly miss his experience, knowledge, enthusiasm and humour. The new ESB Networks website went live last Thursday, please take a look at www.esbnetworks.ie. This new website follows on from the launch of the ESB corporate website a couple of months ago and is a key part of our digital strategy to communicate and engage with customers and stakeholders in a way that suits them and meets their needs. The Great ElectricAid EURO2016 Predictor Competition! It’s coming up fast – Euro2016! The tournament kicks off on Friday 10th June. Northern Ireland start on Sunday 12th, and Ireland take on Sweden on Monday 13th. Are the Boys in Green the Leicester City of Europe? Which Boys in Green? ElectricAid is running another fun and fund raising prediction competition. We want you to predict the outcome of each group-stage match. You will have 6 “bankers” to beef up tour points tally (be careful here – South Africa were my bankers to beat Japan in the Rugby World Cup!). You also have to predict each group winner, the 2 teams to make the final – and the ultimate winner. As a tie-breaker, you also have to forecast the total number of goals in the tournament. So, no pressure! Seriously, it’s a lot easier to get your head around than our Election Competition, and will give you weeks of fun as we update you on the Leicesters and Villas among our entrants! We will give back 50% of the total entry pool (capped at €500) to our winner and runner-up. Depending on entries, that should mean €325 to our winner, and €175 to our runner-up – and you could win both! It’s for a great cause, and will be a lot of fun. Just complete the attached spreadsheet, and return to Angelica Pacturanan at ElectricAid angelica.pacturanan. The easiest way of paying the €10 entry fee is to make a once-off donation direct from payroll at www.electricaid.ie – here’s the link: electricaid.ie/join-electricaid-esb-payroll. You can also use the attached paper form if you prefer. Entries close at 12 noon on Friday 10th June. So get in touch with your inner Dunphy, and get forecasting! Why not set up sub-competitions with your workmates? Good luck to you all! Reposing at Cunningham’s Funeral Home, Lucan on Monday 23rd May from 6.30 p.m. to 8.30 p.m. Removal to St. Patrick’s Church, Esker on Tuesday 24th, arriving for Requiem Mass at 10.00 a.m. followed by cremation at Newlands Cross Crematorium. Family flowers only please. Our thoughts are with Gerry and his family at this sad time – may she rest in peace. Following the launch of www.esbarchives.ie we now need your help to ensure that we continue to preserve and maintain our corporate memory for both internal and external users of our archives. Records you are creating today are the history of tomorrow. Since the establishment of ESB Archives, we have accumulated a significant collection of archival material. We preserve over 8,000 boxes of archival documents, in addition our collection also includes electronic records, photographs, films and artefacts. Our archives are a unique corporate asset that are utilised for important legal, marketing, innovation, communications and business decisions that form part of a historical business context. As a rule our archives are kept permanently and contain only information that explains and illustrates the key development and activity of our business over time. Rather than being just a matter of nostalgia, our archive is an important investment in the future of our company. 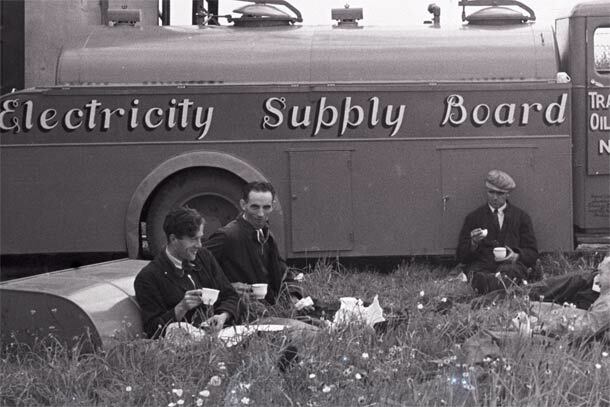 Our collection thanks to your support over those years now forms an important part of the country’s archival records which can be used not only to trace the development of ESB but also at a broader level can also be used to shed light on the of evolution of the State. Please contact us by emailing esbarchives or phone 01-6042146/42132 where our archive will be delighted to offer further assistance. Where possible please provide photos or scans and a description of the records that you think have archival value. For a more comprehensive guide to the types of material we require please click here. The count for the election of members of the DB Superannuation Committee was held today and the following were elected. Congratulations to the successful candidates who will be commencing their roles on 1st July 2016. We would like to thank all candidates for their efforts and interest in becoming members of the Superannuation Committee. After almost 36 years service Mick Regan has decided to retire from ESB Networks at the end of May. Over the years he has worked in Distribution Dept., Dublin City District, Materials Dept., Tanzania and Asset Management. @ All of us that have had the pleasure to work with Mick, are well aware of his immense contribution to ESB over these years. His experience, knowledge and specifically his enthusiasm will be greatly missed. All Mick’s friends and colleagues are invited to attend. The death has occurred of Teresa Kelly (nee White), Banagher, Co. Offaly. Mother of Kieran Pat ESB Fisheries and Frank ex Shannonbridge Station. Reposing at her son Albert’s home, Cornamona, Banagher on Wednesday 18th from 2pm to 10pm. Requiem Mass on Thursday at 12 noon to St. Rynagh’s Church, Banagher, with burial afterwards to St. Rynagh’s Cemetery. House strictly private on Thursday morning. On behalf of my family and myself, I would like to thank everyone in ESB who were so kind and thoughtful in their words and actions following the passing of my Mother recently. I can assure you that your condolences and presence were of great comfort to us all at this difficult time. God Bless. Join us in Number Twenty Nine for some creative fun on National Drawing Day this Saturday, 21 May. Children’s book illustrator Tatyana Feeney will host a dynamic drawing workshop, exploring Dublin: Past, Present and Future. This event is open to children of all ages and abilities, but adults are also welcome to try their hand at some sketching and doodling! 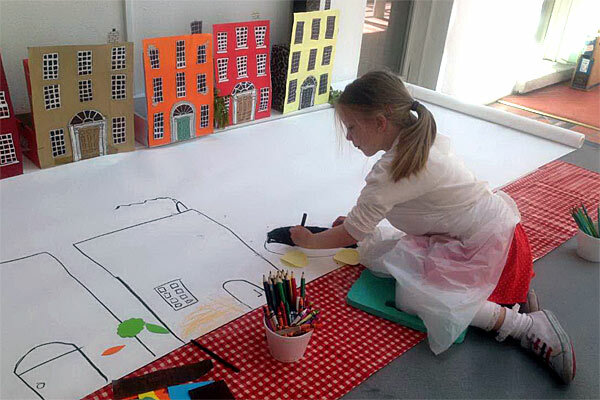 Children will create a spectacular large scale collaborative drawing inspired by Dublin’s famous landmarks and the more familiar buildings in which we live, work and play. This is a 2 hour drop-in drawing session and families are welcome to join us anytime between 2-4pm, free of charge. Booking is not necessary. All materials will be provided. Admission to visit Number Twenty Nine will be free throughout the day. Hi all, if you could register your Topaz Play and Park card for Julianstown Badminton Club I would appreciate it. We need to get 2000 tokens to be entered into the draw, we have not achieved this target any other year. We desperately need a new net and badminton posts as we play with a homemade set at present. It only takes two minutes to register. Thanks in advance! A welcome to new and existing members to Brazilian Jiu Jitsu @ESB with Black Belt Andre Ramos starting tomorrow 17th May. When: Every Tuesday & Thursday starting on the 17th May till the 9th June. Just when you thought it was safe to come out after that booksale … we’re at it again! Look out for the Great ElectricAid Euros 2016 Predictor Competition, coming soon … you have been warned! The Sligo 30K Walk took place in beautiful Sunshine on Saturday last. Our thanks to all you walkers who took part in the event and enjoyed the After Walk festivities – we hope to see you all back next year and encourage your colleagues to sign up! Huge thanks also to the local staff both current and retired who gave their time to man the many water/snack stations and for supporting the walkers along the route. The Walk times are attached and photos will be available shortly. Electric Picnic Ticket required for my daughter who describes this event as ‘highlight of her year’ & unfortunately did not secure a ticket yet . If anyone has a spare or unwanted ticket for this Event , can you please contact me and I will purchase & arrange collection.